Happy Tuesday! The weather has been extremely bipolar the past few days. I spent Sunday hanging out with an old friend, Michelle, and making some DIY cards. She brought a bunch of fun crafty papers and stuff that she has has since 8th grade but never used. Lucky for us that we realized we wanted to make this a crafty night, she was going to throw the stuff out on her next visit home. We drank some delicious Green & Black’s organic hot chocolate that I received in a goody bag from the Blogger Event I attended a while back. We made it using unsweetened almond milk and it was soo creamy and delicious. 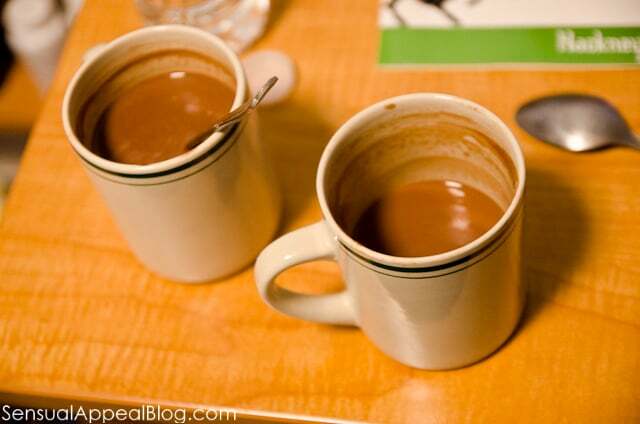 You could definitely taste that this hot chocolate was super high quality – it’s amazing! 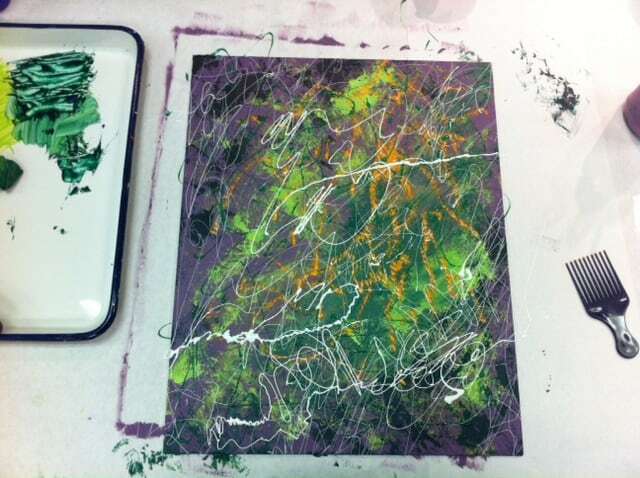 On Monday, my artsy-ness continued with my first time painting! I signed up for a modern painting class through a group deal I found online a few weeks ago which I mentioned in my epiphany post on my photo blog. It was really fun and definitely therapeutic. I wouldn’t say my work was exactly wonderful artwork but it was nice to make something artistic and finally get to learn another medium of art to work with. I have been wanting to learn how to paint for a long time now and modern art has always been my favorite. 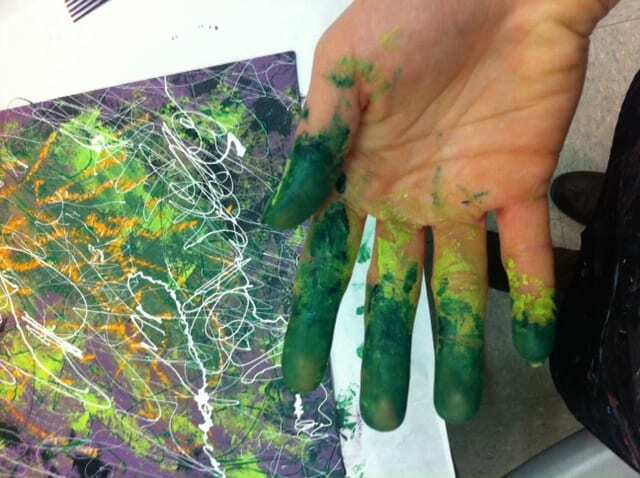 The particular style we focused on today was abstract / action expressionism. We used a variety of techniques and just played around with it. I think mine turned out a little angry and it’s like almost screaming at me. I don’t know why most of my work tends to do that. I guess that’s just the style I like. My hands got pretty messy during the process but it was all worth it! Afterwards, I decided to treat myself with some frozen yogurt since it was on the way back to the train. PS. I decided to make a change in plans in my 365 project on my photo blog if you wanted to read about it. What’s the last flavor of frozen yogurt you had that blew you away? Do you know how to paint? I love your art work! I have been wanting to make soemthing like that for years, but never got a round to it!! Aw you’re sweet, thank you! You should find an adult painting class by you; they provide all of the things necessary to make it, which was a LOT of various things that there is no way I could buy on my own unless I planned to paint all the time. I haven’t had frozen yogurt in SO LONG. Actually, the last time I remember having any was I believe July? Yikes. I should go get some today since it’s so balmy outside! Haha. I’d hardly say I know how to paint, but give me very, very clear directions and I can hold my own. I went to a painting party at Bottle & Bottega a few weeks ago and was pleasantly surprised with how things turned out (but I give pretty much all the credit to the instructor who walked up through things step by step). I really liked the experience, though, and it’s definitely cool to have a piece of artwork hanging in my apartment that I made! And I definitely think you should make your way to get some froyo today! Take advantage of this 63 degree weather. 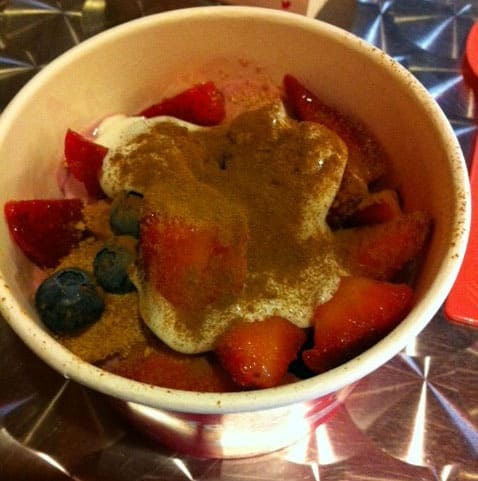 Go to the Forever Yogurt off Belmont Stop, that’s the one I went to yesterday – a lot of great flavors! They do! They actually have painting parties every day of the week at both their Lakeview and South Loop locations. You can check out their calendar at http://bottleandbottega.com to see what each location has scheduled for a particular day. Ohh I agree, some of them are way too sweet. I tend to not get super highly caloric ones but I feel like it’s okay if I do on occasion since my toppings consist of only fruit. I definitely find art and arts/crafts things to be very therapeutic and stress relieving!! I don’t get to do it as much as I would like. I like it. Very Jackson Pollock. I was just dropping by since you were so kind as to comment on my blog on Monday when I was the SITS featured blogger. Also, I’m hosting a giveaway on my blog (it ends Tuesday) if you’d like to come back by and check it out that would be excellent! Ahhhhh, I am SO jealous!! I absolutely love to paint (verdict is still out there on whether or not I actually have any talent) but I haven’t done it in over a YEAR! The last time was at one of those type places where you can bring wine and everybody paints the same picture…after I realized I could pick my OWN colors instead of using the ones everyone else was using, it was so much more fun! I love the style of painting that you did…and now I totally want to go to the store tomorrow and buy some paint! Last mind-blowing fro-yo flavor: Pistachio! I’m usually more of a cheesecake/cake batter girl, but this one was amazing! OMG there is a place like that by me too, where you bring wine and paint! and I am SO doing it after I am done with these art classes. I love painting now. You should come to Chicago and go with me!! Are you coming to BlogHer btw? It’s held in Chicago this year. I haven’t tried a pistachio flavor, that sounds awesome!